For DART® realtime data, click here. To ensure early detection of tsunamis and to acquire data critical to real-time forecasts, NOAA has placed Deep-ocean Assessment and Reporting of Tsunami (DART®) stations at sites in regions with a history of generating destructive tsunamis. NOAA completed the original 6-buoy operational array (map of original six stations) in 2001 and expanded to a full network of 39 stations in March, 2008. DART II became operational in 2005 (Green, 2006). A significant capability of DART II is the two-way communications between the BPR and the TWCs/NDBC using the Iridium commercial satellite communications system (Meinig et al., 2005). The two-way communications allow the TWCs to set stations in event mode in anticipation of possible tsunamis or retrieve the high-resolution (15-s intervals) data in one-hour blocks for detailed analysis. DART II systems transmit standard mode data, containing twenty-four estimated sea-level height observations at 15-minute intervals, once very six hours. The two-way communications allow for real-time troubleshooting and diagnostics of the systems. 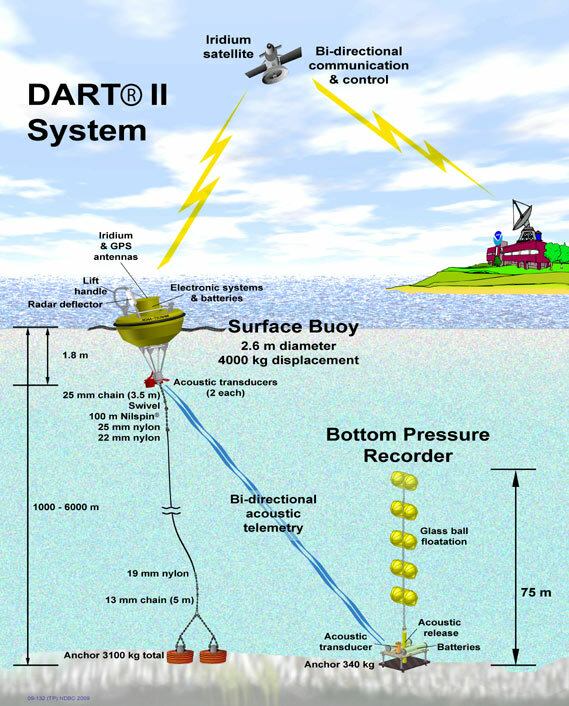 The DART® buoys have two independent and redundant communications systems. NDBC distributes the data from both transmitters under separate transmitter identifiers. NDBC receives the data from the DART II systems, formats the data into bulletins grouped by ocean basin (see the NDBC - DART® Deployment Metadata, for a listing of the bulletin headers used for each transmitted identifier), and then delivers them to the National Weather Service Telecommunications Gateway (NWSTG) that then distributes the data in real-time to the TWCs via NWS communications and nationally and internationally via the Global Telecommunications System. NOAA’s National Geophysical Data Center (NGDC) is the long-term archive center for recovered DART® data, please go to http://www.ngdc.noaa.gov/hazard/DARTData.shtml for more information. Deep-ocean Assessment and Reporting of Tsunamis (DART®): Brief Overview and Status Report. In Proceedings of the International Workshop on Tsunami Disaster Mitigation, 19-22 January 1998, Tokyo, Japan. Green, D. (2006): Transitioning NOAA Moored Buoy Systems From Research to Operations. In Proceedings of OCEANS’06 MTS/IEEE Conference, 18-21 September 2006, Boston, MA, CD-ROM. Meinig, C., S.E. Stalin, A.I. Nakamura, H.B. Milburn (2005), Real-Time Deep-Ocean Tsunami Measuring, Monitoring, and Reporting System: The NOAA DART II Description and Disclosure. Milburn, H.B., A.I. Nakamura, and F.I. Gonzalez (1996): Real-time tsunami reporting from the deep ocean. Proceedings of the Oceans 96 MTS/IEEE Conference, 23-26 September 1996, Fort Lauderdale, FL, 390-394.